I still have 6 cities from my European vacation left to blog, but in the meantime, I thought you might like to see what I made for dinner at home tonight. 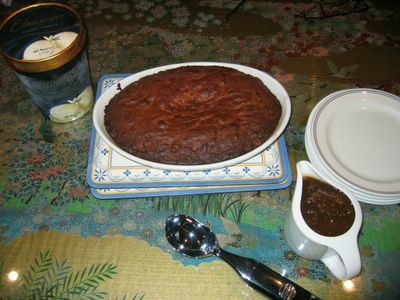 It was a 2-course affair: a Thai seafood curry, followed by a sticky date pudding. This is a very Australian combination. 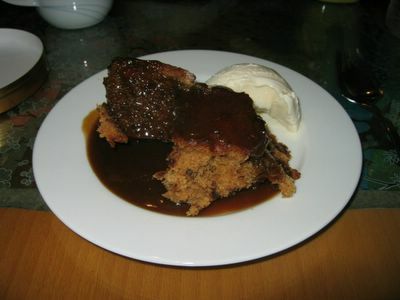 I say, almost without exaggeration, that every single restaurant in Australia has sticky-date pudding on its menu. I used the sticky date pudding recipe from Jamie's Dinners (that's Jamie Oliver, obviously). I also had recipes from Donna Hay, Jill Dupleix and Nigella Lawson, but thought that Jamie's looked the best. Donna's looked a bit naff, and Jill's didn't have a picture. Nigella's was one of those self-saucing puddings which I find trumendously difficult because I can never tell when they're properly cooked. Where does the cake batter end and where does the sauce begin?! 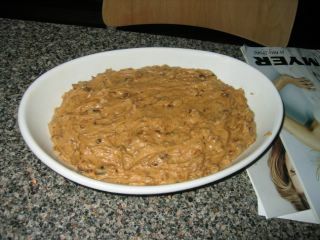 Additionally, Jamie's recipe included Ovaltine and yogurt - how interesting! (I actually used Milo and not Ovaltine, but this didn't seem to have a detrimental effect). So, it's basically an ordinary cake batter, to which you add soaked and chopped dates, a bit of Milo and yogurt. I let this bake while we ate the curry. Nigella's Thai Pumpkin and Seafood Curry (Nigella Bites) is a family favourite. It's really easy and quick to make (about 30 minutes), lends itself well to last-minute variations, and most importantly, it tastes brilliant. In fact, it tastes so good that my father is consistently surprised that the recipe comes from a British food writer and not a Thai one. Today I used brocolli as the vegetable because we needed to use it up. I know it makes the curry look a bit crap-pan-Asian-food-court, but it certainly doesn't taste like it. 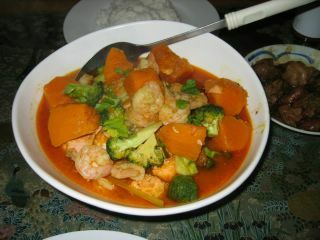 I love the warm rounded spiciness of the curry - it's just what I want to eat after a hard day of work or school. So, back to the pudding. While it's cooking, you make a sticky-toffee sauce by heating cream, butter and light muscovado sugar in a pan until thickened and a bit darker. At the table, you pour the sauce over each individual serving. This is a great pudding. A crusty top, the light and soft sponge, and of course, that sweet, sweet sauce. What bliss. That pudding looks delcious, I'll have to try that sometime. Yummeeeee, yes please! Havent tried Jamies pudding yet but have tried Nigellas which was good. Jamies sounds much more luscious though! As for the curry, I love that curry too, youre the 2nd person this week to make it, think The next Nigella was the other one, s I explained I leave out the prawns as think the salmon is enough, and am now reminded of how long ithas been since I made it so might have to post my version soon & make it a hat trick!